Just 100 days to go! 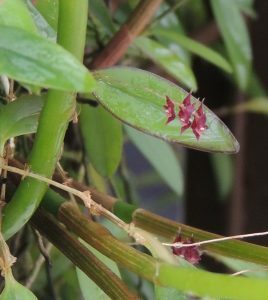 This tiny flowered species which is endemic to North Eastern Colombia arrived in the school greenhouses as a ‘weed’ on Pleurothallis sclerophylla and has since expanded into a ball and produced many offspring. The flowers are produced in sprays on a 1cm spike and usually line up back to back so that flowers look two ways. The plant is in flower for much of the year but I am sorry to say we often forget it because the flowers are so small. From our experience this miniature is easy to grow mounted when kept cool and wet.